Yup, you read that right! 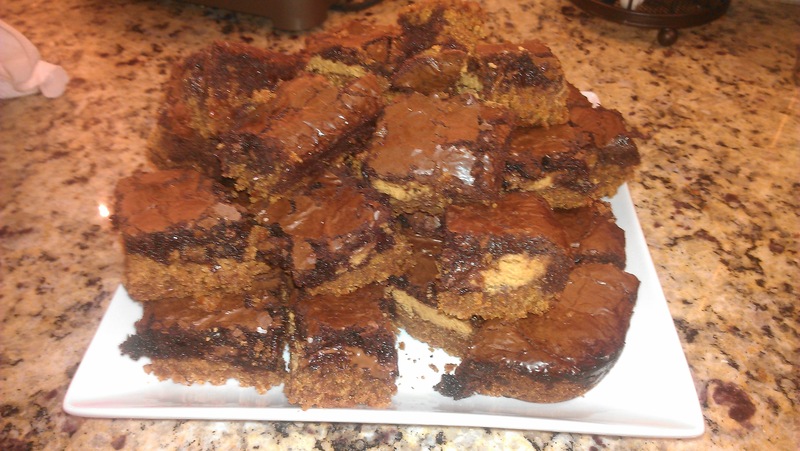 Someone posted this recipe on my message board, and as soon as I saw “pretzel”, “peanut butter” and “brownie” in the same title — DONE! While I’m not a huge chocolate person (shocking, right? )…..once you mix it with peanut butter, I become a HUGE fan of chocolate! But that’s it….only if it’s with peanut butter. I’d been cooking ALL. DAY. LONG and I was tired….but I knew once dinner was over and the kitchen was clean, I could sink my teeth into one of these! The recipe came from HERE. I followed the recipe exact, because I had gotten all the ingredients this time! And they did NOT disappoint! I had one, but no one else in the family has. Olivia was in bed by 7:15, not felling well…Ava got punished because she didn’t eat dinner (can’t have your pudding, if you don’t eat your meat) and Joe is asleep on the couch. But now that I’ve cut them up…once the smell makes its way to the living room….he’ll be up! For now though……I may just have another one! They are a little rich and sweet…so cut them into smaller “brownie pieces” unless you like rich and sweet. There is NOTHING healthy about these….so if you are dieting or watching what you eat…LEAVE NOW before you see the picture! If you are anti-diet, feast your eyes on these………. (that is heaps of peanut butter from the peanut butter cups). 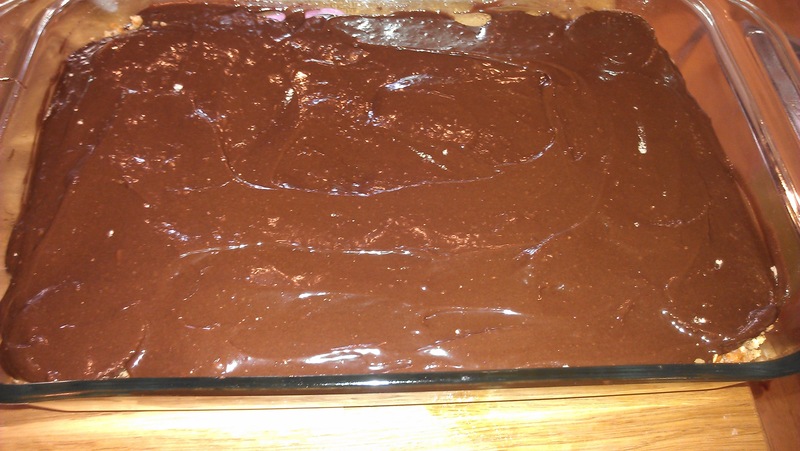 OK….I won’t waste any more time…here’s the recipe! 1. Crush the pretzels in a food processor (or however you’d like to crush them). Don’t crush to dust….make sure there are small pieces still in the mix. Press lightly into a greased 13×9 pan. 2. Make cookie dough according to package. Lightly press cookie dough evenly on top of pretzel crust. 3. 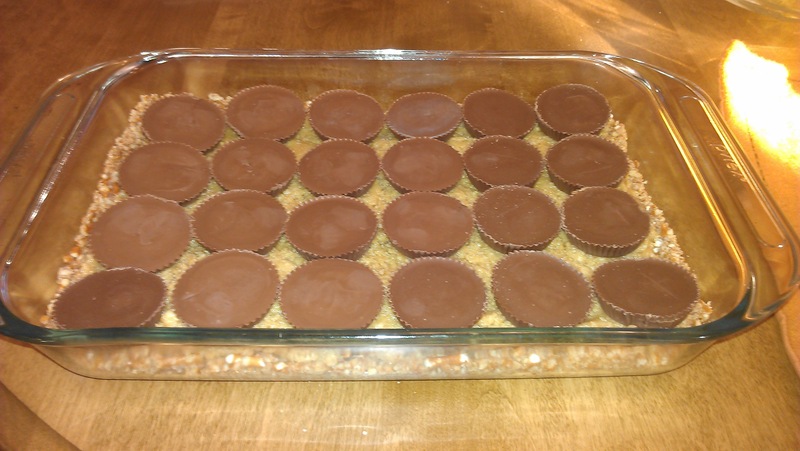 Unwrap 24 Reece’s Peanut Butter Cups and layer them on top of cookie dough. 4. 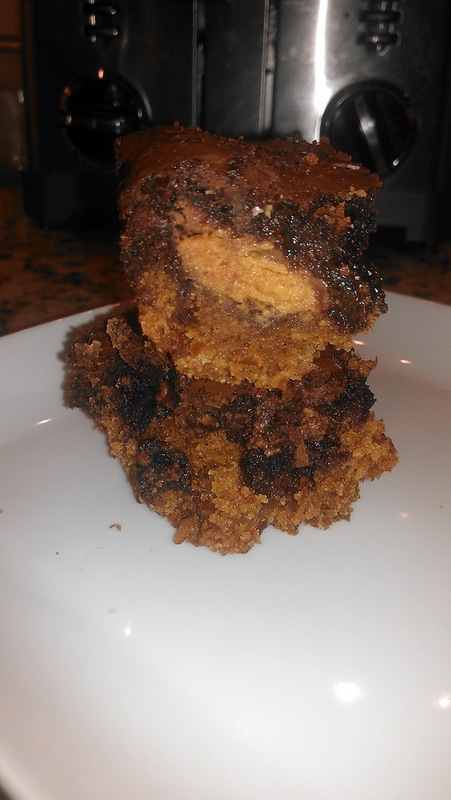 Make brownie mix according to package and pour evenly over Peanut Butter Cups. 5. Bake at 350 degrees for 40-45 minutes. 6. Remove, Cook and ENJOY! My good camera is broken (sad face) so these pictures are from my phone…and do not do it’s justice!